Students who receive a scholarship and plan to apply for Federal Financial Aid should contact the Office of Student Financial Services to inquire as to how it may affect their financial aid award. E-mails should be sent to scsfinaid@georgetown.edu. The Georgetown University School of Continuing Studies awards various scholarships for students who have completed service terms with eligible organizations. See below for information regarding eligibility. All supporting documentation must be received by the Add/Drop deadline stated in the SCS 3-year Academic Calendar. Scholarships may not be used in conjunction with one another. Please email scsscholarships@georgetown.edu with any questions or concerns. Former Jesuit Volunteers bring unique, valuable perspectives to the classroom through their experiences serving their communities. In keeping with Georgetown's Catholic and Jesuit heritage, and informed by our commitment to living as women and men in service to others, we honor those who have served for at least one (1) year with the Jesuit Volunteer Corps or Jesuit Volunteer Corps Northwest by applying a tuition discount to eligible students. Applicable programs: All Master of Professional Studies (MPS) programs, Executive Master of Professional Studies (EMPS) programs, and Bachelor of Arts in Liberal Studies (BALS), Master of Arts in Liberal Studies (MALS), and Doctor of Liberal Studies (DLS) programs. Discount amount: Former Jesuit Volunteer Corps and Jesuit Volunteer Corps Northwest members are eligible for a 15% tuition discount during each semester in which they are registered for classes. Tuition rates are adjusted annually and go into effect at the conclusion of each spring semester. This scholarship shall not apply to study abroad programs or any additional fees levied by Georgetown University. Students must remain in good academic standing according to the standards set by their program and the Office of Academic Affairs and Compliance for the duration of the program in order to continue receiving the tuition discount. Former City Year volunteers bring unique, valuable perspectives to the classroom through their experiences serving urban communities across the country. In keeping with Georgetown's Catholic and Jesuit heritage, and informed by our commitment to living as women and men in service to others, we honor those who have served for at least one (1) year with City Year by applying a tuition discount to eligible students. Discount amount: Former City Year volunteers are eligible for a 15% tuition discount during each semester in which they are registered for classes. Additionally, one student is eligible for a 25% discount during each semester in which they are registered for classes. Tuition rates are adjusted annually and go into effect at the conclusion of each spring semester. This scholarship shall not apply to study abroad programs or any additional fees levied by Georgetown University. Student Requirements: As part of the application process, former City Year volunteers interested in receiving a scholarship must submit with their application a letter of recommendation from City Year certifying that the applicant is in good standing and completed the requisite period of service. Learn more about City Year Alumni discounts on their alumni portal. All supporting documentation must be received by the Add/Drop deadline stated in the SCS 3-year Academic Calendar. Scholarships may not be used in conjunction with one another. Students must remain in good academic standing according to the standards set by their program and the Office of Academic Affairs and Compliance for the duration of the program in order to continue receiving the tuition discount. More information can be found in our Student Handbooks. Former AmeriCorps volunteers bring unique, valuable perspectives to the classroom through their experiences serving at nonprofits, schools, public agencies, and community and faith based groups across the country. In keeping with Georgetown's Catholic and Jesuit heritage, and informed by our commitment to living as women and men in service to others, we honor those who have served for at least one (1) year with AmeriCorps by applying a tuition discount to eligible students. Discount amount: Former AmeriCorps volunteers are eligible for a 15% tuition discount during each semester in which they are registered for classes. Tuition rates are adjusted annually and go into effect at the conclusion of each spring semester. This scholarship shall not apply to study abroad programs or any additional fees levied by Georgetown University. Students must remain in good academic standing according to the standards set by their academic program and the Office of Academic Affairs and Compliance for the duration of the program in order to continue receiving the tuition discount. More information can be found in our Student Handbooks. World Bank Staff Association Members accepted to Master of Professional Studies degree and Executive Master of Professional Studies degree programs at Georgetown SCS are eligible for a tuition discount during each semester in which they are registered for classes. Discount Amount: Current World Bank Staff Association members are eligible for a 10% tuition discount during each semester in which they are registered for classes. Student Requirements: In order to receive the tuition discount, students must submit a letter at the beginning of each term from the World Bank Staff Association certifying that the student is still an employee of the World Bank and a member of the World Bank Staff Association in good standing. This letter is due within two weeks of registration for classes each term and must be attached in an email to scsscholarships@georgetown.edu. The LaFarge Scholarship awards three scholarships per academic year: One to a student who studied at Montgomery College, one to a student who studied at Northern Virginia Community College, and one to a student who studied at Prince George’s Community College. The three LaFarge Scholarships provide each recipient with a 50 percent reduction in tuition costs for the duration of the student’s time as a degree-seeking student in the Bachelor of Arts in Liberal Studies program, as long as the student maintains a cumulative GPA of at least 3.0 in Georgetown courses. The Rev. John LaFarge Jr, SJ, was an American Jesuit priest. For decades, he served as an editor and writer for the Jesuit magazine America. He was noted for his efforts to promote racial tolerance. Visit the BALS Financial Aid page for more information. The Osher Reentry Scholarship awards up to $5,000 per student per academic year and is dedicated to both newly admitted and current students in the Bachelor of Arts in Liberal Studies program. Have experienced a cumulative gap in education of five or more years. Anticipate workforce participation for a significant period of time after graduation. Show academic promise and a commitment to graduating with a degree. The Osher Reentry Scholarship program is made possible by the Bernard Osher Foundation, headquartered in San Francisco and founded in 1977 by Bernard Osher, a respected businessman and community leader. The foundation seeks to improve quality of life through support for higher education and the arts. The foundation provides postsecondary scholarship funding to colleges and universities across the nation, with special attention to reentry students. The Mayor’s Scholars Undergraduate Program provides need-based funding for eligible DC residents earning their first associate’s or bachelor’s degree at select area colleges and universities. Recipients of Mayor’s Scholars funding can receive up to $4,000 per academic year, for up to four years for an associate’s degree, and up to six years for a bachelor’s degree. The funds are available first-come, first-serve, and applicants must re-apply each year. There is no guarantee applicants will receive funding, as funds are only available until they run out. Visit the D.C. Mayor’s Scholars Undergraduate Program for more information. The Crankstart Foundation Re-entry Scholarship awards up to $5,000 per student per academic year and is dedicated to both newly admitted and current students in the Bachelor of Arts in Liberal Studies program. The Crankstart Foundation is the charitable enterprise of Michael Moritz and Harriet Heyman. The couple's philanthropy in the California Bay Area is mainly focused on education, and arts and culture, but support has also gone to parks and human services. The Crankstart Foundation Re-entry Scholarship is made possible only by the generosity of Mr. Moritz and Mrs. Heyman. The Phi Theta Kappa Bridge Scholarship is awarded to one student each year entering the Bachelor of Arts in Liberal Studies program at Georgetown University. The scholarship grants the student a 50 percent reduction in Georgetown tuition costs for the duration of the student’s time as a degree-seeking student in the Bachelor of Arts in Liberal Studies program, as long as the student maintains a cumulative GPA of at least 3.5 in Georgetown courses. One Christopher H. Collins Opportunity Scholarship will support a student to attend the MPS in Real Estate program. The student will be in need of financial resources, reside in the District of Columbia, and have a background or experiences that when evaluated holistically, suggest they are uniquely able to contribute to the diversity of the Georgetown community. Factors which may be considered include the student’s socioeconomic, cultural and/or family background, personal experiences and challenges, and/or demonstrated ability to develop and support diversity and cultural understanding. Applicable program: Master of Professional Studies (MPS) in Real Estate. Discount Amount: The District of Columbia Building Association (DCBIA) will fund one scholarship to cover 100 percent of the cost of tuition needed to complete the MPS in Real Estate program. Student Requirements: Applicants must be new students starting in the fall 2018 semester. Factors which may be considered include the student’s socioeconomic, cultural and/or family background, personal experiences and challenges, and/or demonstrated ability to develop and support diversity and cultural understanding. Please note that financial need is just one aspect of consideration. The selected Christopher H. Collins Opportunity Scholarship recipient must remain in good academic standing according to the standards set by the MPS in Real Estate academic program and the Office of Academic Affairs and Compliance for the duration of the program in order to continue receiving the scholarship. Scholarship essays and completed admissions packages must be received by July 15, 2018 in order to be considered for the scholarship. One winner will be selected by August 1, 2018. Applicants must also submit a 2018-2019 FAFSA by the July 15, 2018 deadline in order to be considered for this scholarship. In order to be considered for the Christopher H. Collins Opportunity Scholarship, applicants must submit a 300-word essay on the following topic. Completed essays should be sent as a Word document to: scsscholarships@georgetown.edu. Please describe your personal and professional goals for applying to the Master of Professional Studies in Real Estate program. How will you strengthen and support greater diversity within the student body and your chosen area of focus in real estate? 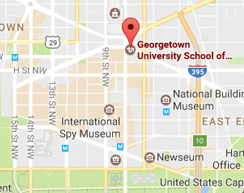 Georgetown University has a grant from the National Science Foundation (NSF) through the CyberCorps™ Scholarship for Service Program to provide scholarships to students to earn degrees critical for cybersecurity in exchange for service in the form of employment in a governmental cybersecurity position. This national program is designed to educate the individuals who will design and protect the nation's critical information infrastructure, define the policies, write the laws that govern and protect this infrastructure, and educate the nation's future generations of cybersecurity professionals. Applicable program: Master of Professional Studies in Cybersecurity Risk Management, or any other Georgetown degree program that will result in sufficient cybersecurity training to be hired into a governmental cybersecurity position. Student Requirements: Students must be enrolled in a full-time degree program. For questions, contact cyberfellows@georgetown.edu or visit the Georgetown Cyber Fellows website.